We never forgive those we've wronged. Lavender is a perennial member of the large mint family and does well in situations with full sun and dry, well-drained, average soil. Though there are around 30 varieties, the most popular for the home garden are the hardy English and more tender French and Spanish types. English lavender is considered the top choice for fragrance purposes, but all the lavenders make lovely, fragrant additions to almost any type of home situation, as long as they are given very well-drained soil and lots of sunlight. Though English lavender can make it through the winter if given some shelter from the elements and a good protective mulch, the French and Spanish types should be moved inside or replaced yearly. Though we are all aware of the fragrant properties of the lavenders, these plants also make useful additions to the medicine cabinet and are often used in various craft projects. 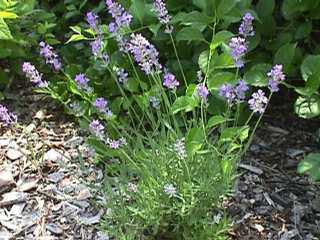 The flowers can be candied for use in decorating cakes and confections (see Violet for instructions), and the leaves can be substituted for Rosemary in chicken dishes, but otherwise Lavender is not used widely in cooking. The flower spikes make wonderful additions to dried and fresh flower arrangements, the oils make for the best in aromatherapy and are used medicinally and for homemade bed and bath items, and the attractive, bushy habit makes Lavender a natural for many different types of garden situations. The stems, once stripped of leaves and flowers can be burned like an incense stick for a wonderful room freshener. Additionally, this is a plant that attracts bees and beneficial insects. For specifics on other uses for this wonderful herb, please see the links above. 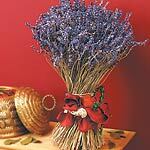 More information on Lavender is available in the Gardening QA Section. Click here to see what other gardeners are asking.